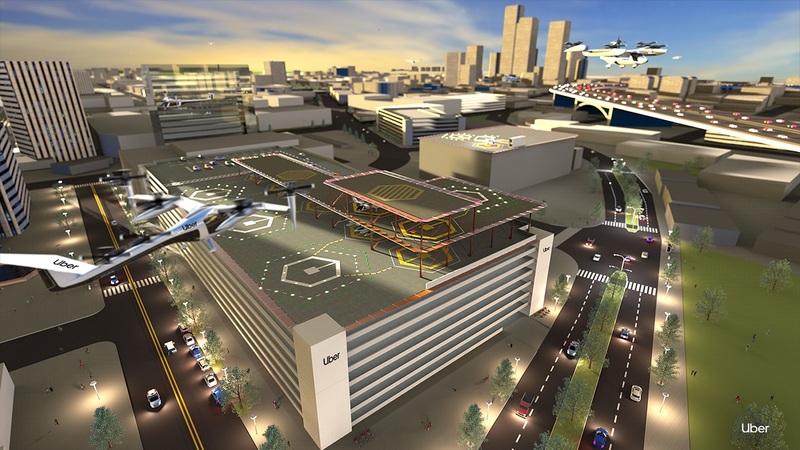 Uber is looking to offer high-tech rides through a network of rooftop skyports in its planned Uber Air service, with plans to begin demonstration flights next year in Los Angeles and Dallas. Illustration: Uber Technologies Inc. It may not be enough anymore to just add a rooftop deck or pool to your luxury development if you want to stay competitive. You may need to make space for a skyport where Jetsons-like flying cars can land, too. Developers in cities from Los Angeles to Miami are preparing for that future with plans for mixed-use towers that could include rooftop skyports for “flying cars,” also known as vertical-landing aircraft, that are under development by companies including ride-hailing giant Uber, which is looking for partners to test its product. It’s just another way today’s world is catching up to the 1960s futuristic outlook of the cartoon about the Jetson family set in the 2060s. While executives contend there’s much to be done in terms of regulation and public buy-in before this future actually comes to pass, many say it could prove worthwhile for commercial property owners and their brokers to figure out how they might fit into that future world. For instance, developers could begin to explore the current airspace opportunities and legal limitations for incorporating take-off and landing pads in a given office or mixed-use development. It’s a sign of how the rapidly evolving high-tech industry is seeping into the commercial real estate industry, pushing some developers to think far into the future as they plan to compete for tenants and make their projects more lucrative. Tech giant Uber definitely sees the opportunities and is scouting cities where it can work with developers to test its flying cars through a service known as Uber Air. “Uber Air is the aviation product that will make it possible for people to tap a button and request a flight,” the company states on its website. Early renderings indicate Uber’s planes could resemble the military’s Osprey aircraft, which have fixed wings like planes but also a system of rotors that allow them to take off and land vertically like helicopters. 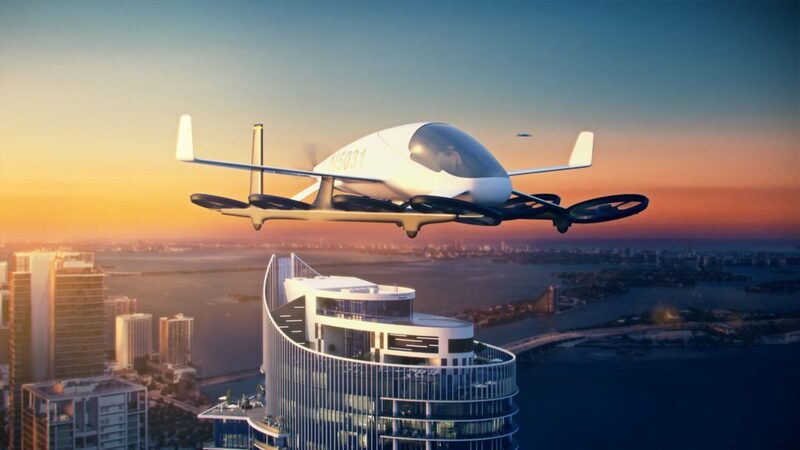 The website for its Uber Elevate division states the company wants to begin demonstrator flights in Jetsons-like vehicles in 2020 – starting in Los Angeles and Dallas – and make commercial flights on Uber Air available to riders in 2023. A spokesman for the San Francisco-based company said officials were not commenting further. The company is scouting international cities for the service including Australia, Brazil, France, India and Japan. No specific property locations have been announced, as Uber works on elements including airspace management, battery development and infrastructure for a network of skyports atop commercial and residential high-rise buildings. Outside of Uber, NKF’s Kasselman points to at least two upcoming projects where airborne transport has already been incorporated. One is developer Daniel Kodsi’s 60-story Paramount Miami Worldcenter residential condo tower in Florida, set for completion later this year, which has a skydeck that could eventually be transformed into a skyport for high-tech air travel. Also, Kasselman is serving as a consultant to other developers on plans for a mixed-use project near Bettendorf, Iowa, that would incorporate skyports, though he did not elaborate. The concept of flying cars isn’t that far off from what exists now. When retail giant Amazon still planned on opening a second headquarters hub in New York City, its Chief Executive Jeff Bezos sought a helipad where he could quickly travel in and out of the property. Meanwhile, start-up companies in traffic-congested cities such as Los Angeles are pitching ideas for airborne commuting services such as mini-plane commuter firm FLOAT, which stands for Fly Over All Traffic, that could take travelers from home to work and back again every day. Kasselman predicts such vertically landing aircraft technology could become mainstream in projects nationwide within the next five years, though others say its acceptance could prove much slower in arriving. Spencer Levy, head of Americas research for brokerage CBRE Group, told the San Diego crowd that cities will be hesitant to permit lots of flying in dense urban areas, wary of accidents like the deadly 1977 helicopter crash atop the PanAm, now MetLife, building in New York City, where officials to this day heavily restrict air traffic in Midtown Manhattan, especially after the Sept. 11, 2001, terrorist attacks. Hopes for smaller-plane services along the lines of cargo delivery drones, being tested by companies like Amazon, face similar acceptance challenges in urban areas. “The technology has been there before, but they have a problem: It’s called the ‘drop the box on Grandma’s head’ problem,” Levy said.